Την σεπτήν σου εικόνα ως της δόξης σου σκήνωμα, * Ιεροσολυμίτισσα Παρθένε, προσκυνούμεν Πανάχραντε. * Εκ ταύτης γαρ πηγάζεις μυστικώς θαυμάτων ποταμούς τας δωρεάς * και αρδεύεις τας καρδίας και τας ψυχάς των πίστει κραυγαζόντων σοι * Δόξα τω Θείω Τόκω σου, Αγνή, * δόξα τη παρθενία σου, * δόξα τη προς ημάς σου ανεκφράστω προνοία, Άχραντε. 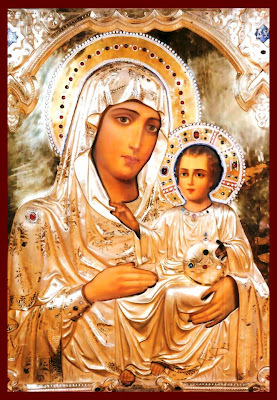 As the glory of your house, our Lady, Virgin, of Jerusalem, your holy icon do venerate All-Spotless One. For mystically flowing from it, are free-flowing rivers of miracles, and you water for the faithful their hearts and souls, for those who cry to you, Glory to Your Divine Child, o Pure One, glory to your virginity, glory to your indescribable providence for us, O Spotless One. "Sister Tatiana, I have come so that you can paint me." Tatiana replied, "Let it be, Blessed Sister; however, I am an iconographer and not a painter." The lady replied, "...well then, you should paint me using your iconographic style." Sister Tatiana was furious with the boldness of this lady's response and said, "I do not have any plank of wood to use." The lady then gave her the plank of wood the sister would need and told her to "paint." In obedience to her guest, the sister started her iconography. Sister Tatiana glanced at her guest, and she noticed the guest's appearance transfigure in front of her. The lady's mantle started to turn into gold and her face was glowing intensely. This change in the appearance of the lady worried Tatiana but the lady spoke to her, saying: "O Blessed Tatiana, you are the only person, after the Apostles and the Evangelist Luke, to have this opportunity to write an icon of me again." Sister Tatiana then realised that she was in the presence of our Holy Mother the Theotokos. In shock she awoke from her vision. She immediately went and informed her Mother Superior of the vision in detail. The abbess did not believe in the story but told her to go to sleep and the following day she could paint an icon of the Panagia with her blessing. The mysterious and miraculous appearance of the icon had the sisters in shock but our Holy Mother the Theotokos appeared once more to Tatiana and said, "Now take me from here down to my home in Gethsemane of Jerusalem." This is what the abbess and the sister did. From that time, the "acheiropoihti" (made not by human hands) icon of Panagia "Lady of Jerusalem" ("Ierosolymitissa") is found in the Holy Shrine of the Tomb of the Panagia in the Gethsemane, and continues to work miracles. An additional note: St. Paisios of Mount Athos (1924-1994) commented that, having had the blessing to see the Theotokos in visions, the icon of Panagia "Ierosolymitissa" closely resembles her holy face, more than any other icon.